Taste great..love the peach flavor. 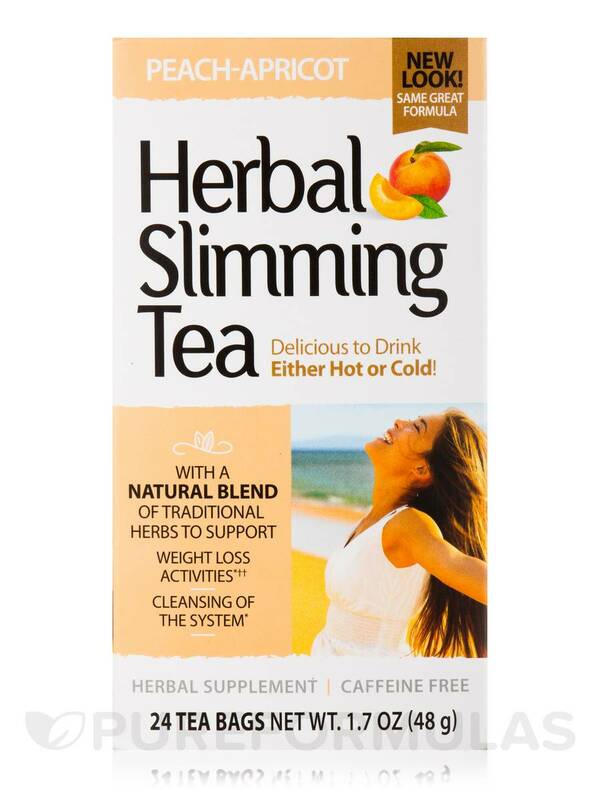 I just starting drinking it so Im not sure how well it works for slimming but love the flavor. Slimming Tea Peach Apricot by 21st Century has wonderful taste.It controls appetite perfectly well! I love the flavor a lot. 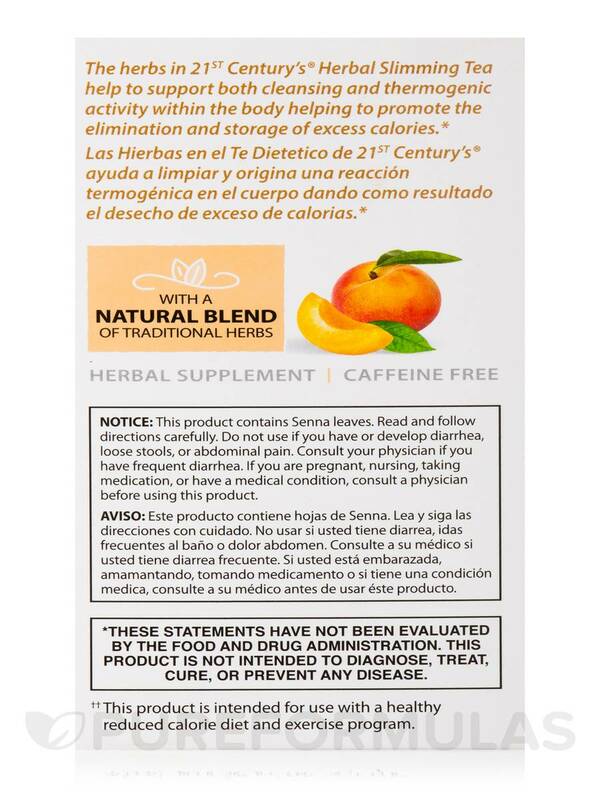 First time I drank Herbal Slimming Tea, Peach Apricot by 21st Century, I drank too much. I had very loose BM. 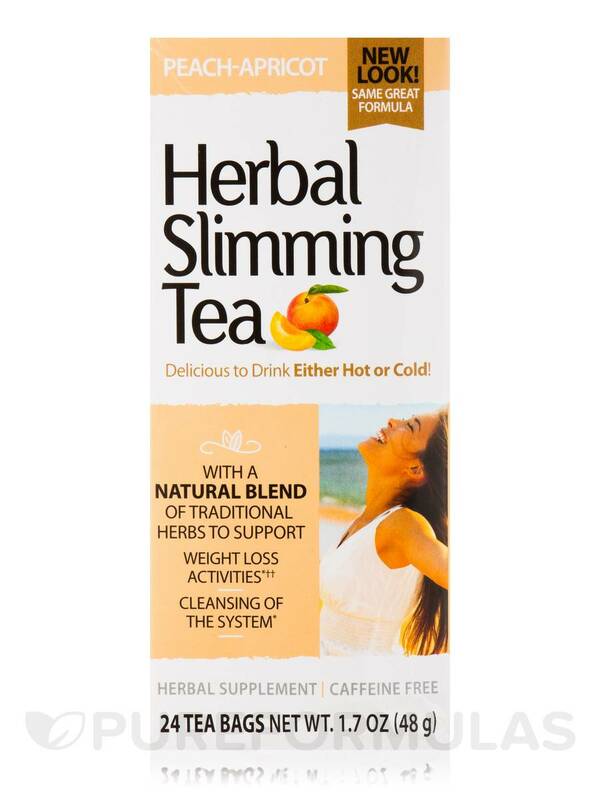 Help yourself get back into shape with Slimming Tea from 21st Century®. This beverage blends natural hers in a caffeine-free formula that may also improve digestion. This tea tastes great hot or cold‚ especially at the end of a meal. The ingredients in this formula lend a boost to metabolic activity and help cleanse your system. Senna leaves may function as a laxative to alleviate constipation‚ correct irritable bowel conditions and promote weight loss. Sennosides irritate the lining of the GI tract and cause a laxative effect. Malve leaf may soothe mucus membranes and curb inflammation. It may loosen and expel phlegm to reduce lung irritation. It could also work as a mild laxative when administered in higher doses. Panax ginseng may relieve stress‚ and reduce inflammation of the digestive lining. Licorice root helps address digestive system troubles and promotes a sense of well-being. Slimming Tea from 21st Century® may expel stored calories from your body and help you feel lighter and more positive as you go about your day. 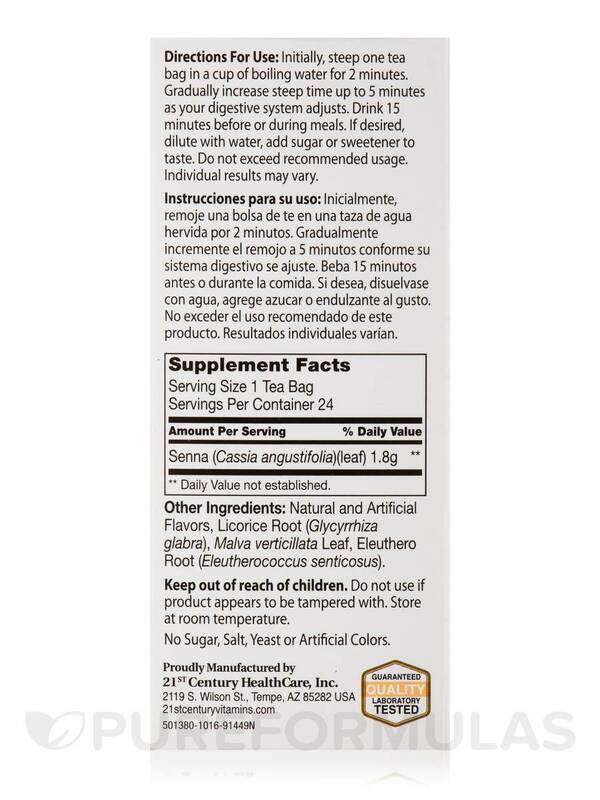 Other Ingredients: Natural and artificial flavors‚ licorice root (glycyrrhiza glabra)‚ malva verticillata leaf‚ eleuthero root (eleutherococcus senticosus). Caffeine-Free / Sugar-Free / Salt-Free / Yeast-Free / Artificial Color-Free. Initially‚ steep one tea bad in a cup of boiling water for 2 minutes. Gradually increase steep time up to 5 minutes as your digestive system adjusts. Drink 15 minutes before or during meals. If desired‚ dilute with water‚ add sugar or sweetener to taste. Do not use if product appears to be tampered with. 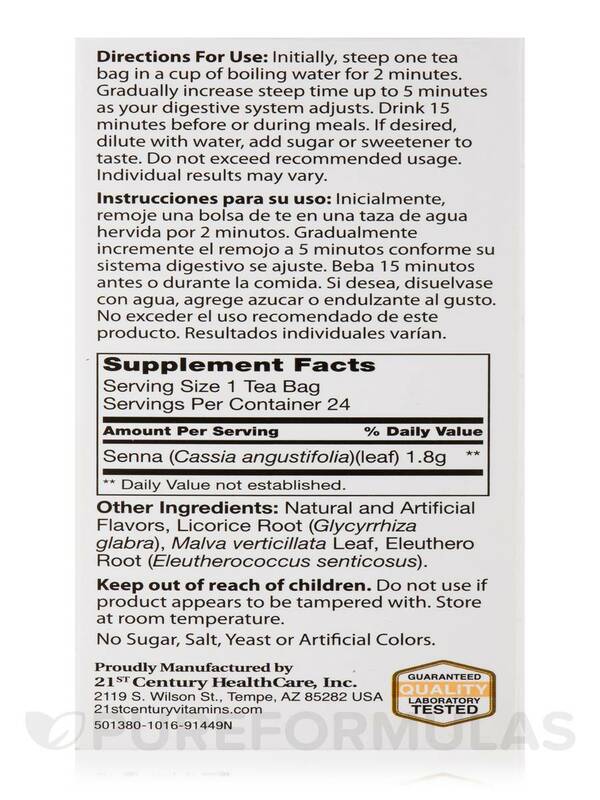 Notice: This product contains Senna leaves. 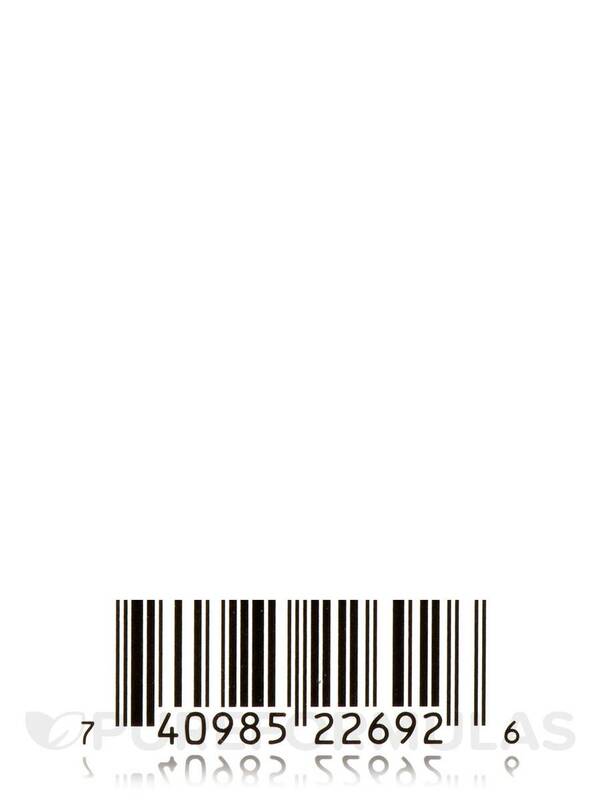 Read and follow directions carefully. Do not use if you have or develop diarrhea‚ loose stools‚ or abdominal pain. Consult your physician if you have frequent diarrhea. If you are pregnant‚ nursing‚ taking medication‚ or have a medical condition‚ consult a physician before using this product. 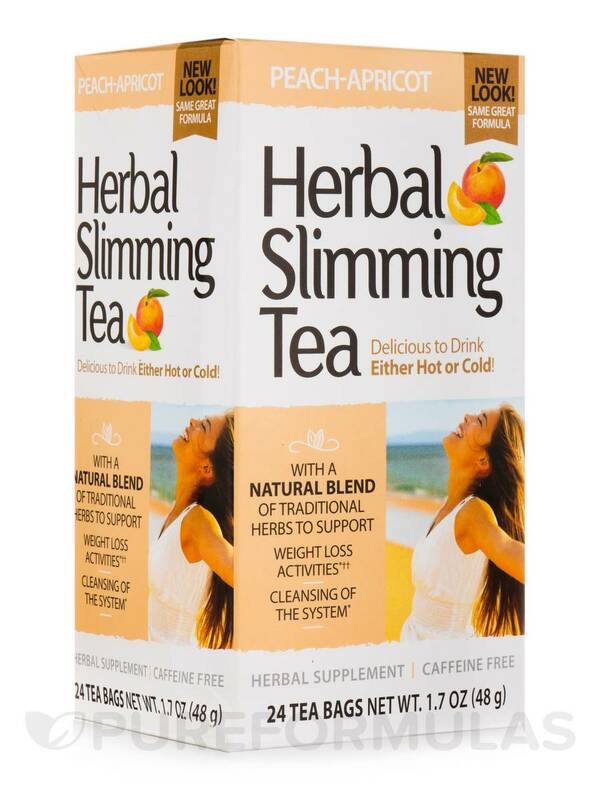 I started drinking Herbal Slimming Tea, Peach Apricot by 21st Century at meals. It has a great taste and satisfies the appetite. I am not as hungry and eat less. Just have to be careful with quantity. 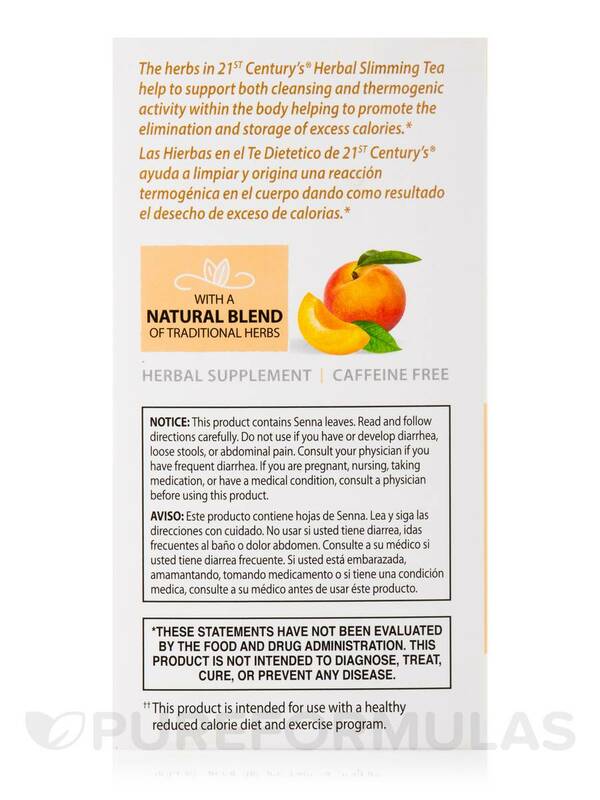 I gave Slimming Tea Peach Apricot by 21st Century a try, didn't do much for me. I was expecting for it to help with my constipation but did not work. this tea works and taste good.